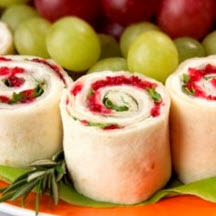 CooksRecipes has quality, kitchen-tested recipes for a variety of appetizer pinwheels, roulades, and roll-ups that are perfect for parties and entertaining. Filled with ingredients that were made for each other and "all wrapped up", it's a sandwich ready to go on a picnic. Or, when sliced into pinwheels, makes a wonderful appetizer. 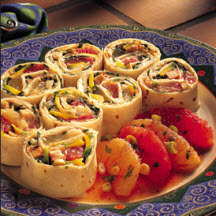 Served with a refreshing grapefruit salsa, these zesty pinwheels are sure to delight your guests.